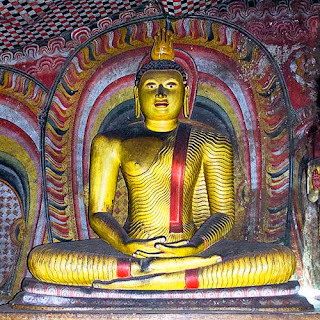 The recorded history of the Dambulla Caves goes back over two thousand years to the time of King Valagama (ruled 103 BC and again 89 BC – 77 BC). The king sort refuge amongst the monks living in these caves when he was ousted from power in 103 BC by South Indian marauders who invaded the country. After a gruelling 14 year campaign Valagama finally regained control and in thanksgiving built the original vihara on this site. Since then the site has evolved organically into its present state. 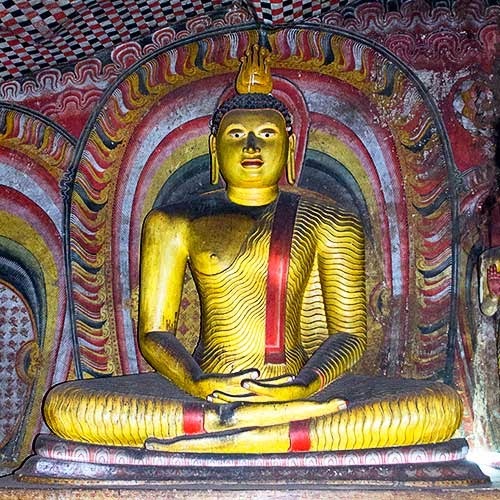 The beauty of the cave temple is its setting into five huge caverns high on a mountainside. Inside are 153 Buddha statues in various reposes, three statues of ancient kings, and four other statues including those of Vishnu and Ganesh. The eyes on some of the statues are interesting. The ceiling and walls have been painted and repainted over the centuries by the resident monks and contain some interesting juxtapose of imagery including those of royal life. See if you can spot the somewhat risqué scene in one of the large murals. It is a scene of a king holding court. But if you peer through the doorway in the painting you will see a couple indulging in some intimacy. Since the ancient site is located on a mountainside there is a rather strenuous climb to the top. Photography is allowed but don’t offend local sensibility by posing with the statues. There is an entrance fee to enter the site. I found the modern additions at the base of the hill a bit garish and lacking finesse.